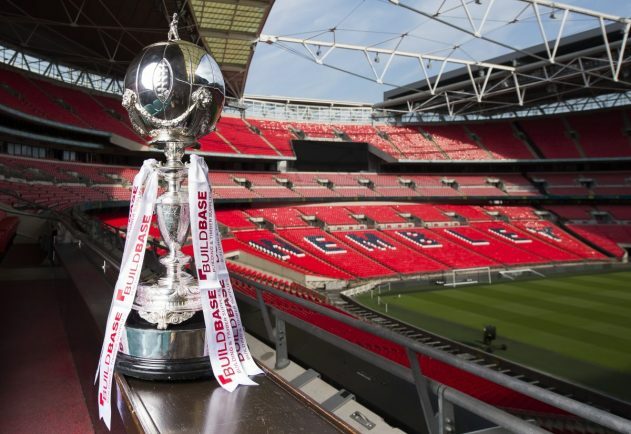 BROMSGROVE Sporting’s first ever venture into the FA Trophy was brought to an abrupt end by fellow Southern League Division One Central outfit Corby Town. A bumper crowd of 954 packed the Victoria Ground to watch the top two teams of the division battling it out in the extra preliminary round, with Corby making their first visit to town since February 2008 when they beat the now defunct Bromsgrove Rovers 2-0 in a Southern League Premier encounter. And it was the visitors who started much the brighter of the two teams today (Saturday), with Corby enjoying plenty of possession as well as looking dangerous on the attack. One key chance fell to Eliot Sandy in the 23rd minute but his guided header went over the bar. However, two minutes later the visitors were in front went Joe Carta capitalised on a poor pass in the middle of the park by Daniel Morris before playing in Sandy who rounded the onrushing Jonathan Brown and tapped into an empty net. Corby’s lead lasted just six minutes, though, with John Pykett rifling home the equaliser from inside the area after latching on to Will Shorrock’s cross from the left-hand side. 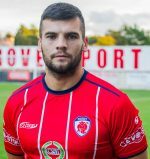 Sporting came close to taking the advantage in the 36th minute but Jack Wilson’s pile-driver of an effort flashed just wide of the far post. With half-time approaching Corby were awarded a controversial penalty, with Morris being penalised for a challenge on Jordan Crawford. Morris had won the ball fairly but not in the eyes of referee Blake Antrobus who may have punished the defender for challenging from behind. Carta took responsibility from 12 yards out, sending Brown the wrong way and slotting home into the bottom right-hand corner. After the break Corby started on the front foot and their pressure was rewarded just five minutes into the second period when Connor Kennedy rose highest to head home Sam Warburton’s corner. Sporting came close to reducing the arrears four minutes later but Dan George was equal to Josh Quaynor’s curling effort from the edge of the area. Brendan Kelly’s men continued to push, with Richard Gregory poking wide of the far post from inside the area with 17 minutes remaining. Corby keeper George had to be at his best to tip over Nathan Hayward’s fizzing shot from distance as Sporting pushed for a way back into the game. Despite having eight minutes of stoppage time to play with, Sporting could not find a way back into the match, ensuring Corby would progress to the next round where they will play host to Yaxley on Saturday, October 13.